Bali, it seems that the charm of this island still captures people’s attention. Not only admired for the beauty of the island and its beaches, Bali is also favored by both local and international travelers because art and tradition are very prominent in all fields. In terms of architecture, Bali has a distinct and strong characteristic. Balinese architecture is very popular everywhere, to foreign countries. Although in some parts there are still elements of ancient Javanese Hinduism, Bali still has its own characteristics. If you often stay in villas or hotels in Bali, you will definitely immediately understand the characteristics of buildings in Bali. Here is the history of Bali architecture you should know. The philosophy of traditional Balinese architecture in prehistoric times to the power of Majapahit (XV – XIX century) is considered as a period of growing and developing traditional Balinese architecture based on lontar asta kosala-kosaili and lontar asta earth. (Bhagawan Wiswakarma and Bhagawan Panyarik) Asta kosala-kosali is a rule about the forms of pelinggih symbols, namely the size of length, width, height, level, and decoration. Asta Bumi is a rule about temple yard area, division of yard space, and distance between pelinggih. Fundamental character variants arise among residents in the plains and mountainous regions and residents of the South Bali region with residents in North Bali. Nevertheless, there are basic philosophies or major philosophies that are the reference points of traditional Balinese architecture, namely the principle of tri angga or tri loka, cosmological concepts (tri hita karana), and cosmological orientation. The principle of triangga or triloka is a concept of cosmological balance which was initiated by the Guru Kuturan. In this principle there are three values about natural relations as “containers” and humans as “fillers”. This value shows the gradation of levels with the divine spirit at the highest level. Applicatively, the tri angga philosophy can be seen from the building’s gesture which shows three levels, namely the head of the body-foot. From the philosophy of tri angga and tri lokaini, develop other conceptions, such as the cosmological concept of tri hita karana and the concept of cosmological orientation. In cosmological orientation, there are conceptions of sanga (sanga mandala / nawa sanga). This conception was born from the combination of astha dala (eight directions of the compass) with the nawa sanga (nine mythologies of the rulers of the wind). The philosophy still focuses on maintaining harmony and harmony in nature. This orientation is determined based on: For the Balinese people, the mountains are used as directions (kajake the direction of the mountains and kelod to the sea). Mount of Agung is the most sacred main orientation. However, for areas that are not close to Mount Agung, it is generally oriented to the nearest mountains. The position of the mountains in the middle causes Bali as if divided into two parts, namely North Bali and South Bali. Therefore, the understanding of the Balinese living in the north to the south is different, even though the standard of their axis remains, namely the axis of kaja-kelod and kangin-kauh. One of the strong elements of architecture in Bali is the concept of architecture that is in harmony with the natural environment. This harmony architecture is a character and inherent as the basic character of Balinese architecture. 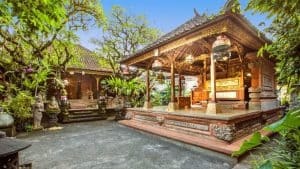 With the concept of Tri Hita Karana, Balinese architecture usually consists of 3 elements of connecting harmony, namely, soul, body and energy. These three elements will create harmony between the natural environment, between humans and humans and God. Usually, the building is marked by a material that is thick with natural nuances such as natural rocks or bamboo. Traditional Balinese Architecture is an architectural work that was born from a tradition, beliefs and spiritual activities of Balinese people which are manifested in various physical forms. Like traditional houses, holy places (shrines called temples), meeting halls, and others. The birth of various physical manifestations is also caused by several factors, namely the geography, culture, customs and socio-economic conditions of the community. Judging from the geographic aspect, there is a traditional Balinese highland architecture (mountainous area) and lowland traditional Balinese architecture. For upland areas in general, the buildings are small and closed to adjust the conditions of the environment which tend to be cold. Wall height is relatively short to avoid air circulation too often. One building can be used for various activities ranging from daily activities such as sleeping, cooking and for certain days is also used for ceremonies. The area and shape of the yard is relatively narrow and irregular according to the topography of the place of residence. For low-lying areas, the yard is relatively wide and flat so that it can accommodate several masses with communicative patterns, generally with open walls, each of which has its own function. Like Bale Daja for sleeping and receiving important guests, Bale Dauh is for sleeping and receiving guests from the ordinary, bale dangin for ceremonies, kitchens for cooking, tame for rice barns, and shrines for worship. For the royal family and the brahmana pekarangn it is divided into three parts, namely jaba Sisi (front yard), jaba tengah (middle yard) and jero (yard for residence). Building materials also reflect the owner’s social status. People used to use popolan (speci made from clay mud) for the walls of the building, while the king and Brahmans used piles of bricks. For shrines / places of worship belongs to one family and a family gathering using materials according to the economic capabilities of each family. As for roofing materials using fibers for the economically capable, for those whose economies are less able to use reeds or roof tiles. The arrival of Hinduism on the island of Bali had a significant impact, especially on its architectural style. Balinese architecture is generally dominated by Hindu influences since the arrival of Majapahit to this island around the 15th century. The arrival of the Majapahit also left culture in the form of sculptural techniques for stone which later functioned as a statue or temple. The carved works from the stone then become one of the objects placed outside the house. Along with the development of the era, the presence of statues and small temples is so attached and identical to the Balinese architectural style, so it is incomplete if we want to design our house with Balinese architecture without the presence of one of these 2 things. Polynesia or worship of many gods is an early culture that existed in the island of Bali before the arrival of Hindus to the island. Therefore, in some architectural styles we can still find elements of this culture. Balinese people often build temples or their homes with an open concept, especially for matters of worship / worship of the gods. In fact, we often see in a temple complex there are more than one temple where each temple is used to worship different deities. For buildings that are not designed for worship activities, the building is mostly made of bamboo and other materials that are thick in nature, such as natural rocks. As we often see in some media, houses in Bali tend to have complex but neatly arranged structures. Houses with traditional Balinese architecture do not only consist of one structure unit, but rather lead to a collection of buildings where each building is occupied by one family head. Usually, those who live in this complex are large families and come from the same descendants. Around this building complex, a wall that is not too high is built, but enough to separate it from the outside world. All in all, Bali always looks awesome from all side we see it. It is truly like a dream place of livings where the beautiful of nature unites with the best culture. Is that only me who wants to live in Bali longer than one month?